Integration Charter Schools (ICS) is dedicated to providing innovative pathways to college that fully integrate students living with emotional challenges and others with special needs. In building a network of associated schools which share this common mission, ICS strives to fill gaps in public education. 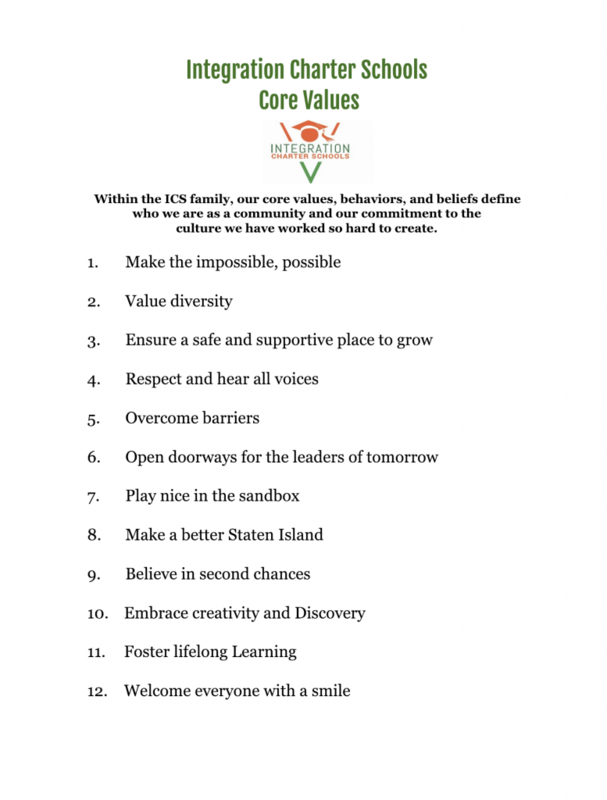 When fully realized, ICS, in conjunction with local public schools, will provide Staten Island parents of special needs children with an array of options which is richer than that enjoyed by any other community in the United States. ICS’s John W. Lavelle Preparatory Charter School, Staten Island’s first charter school, was established in 2009 with the mission of fully integrating students experiencing emotional challenges with a rigorous college preparatory education that equips and empowers students to go to college and succeed in life. The charter serves students in grades 3 – 12th with 40% of the admission seats are reserved for students with an IEP. In 2015, Lavelle Prep spearheaded the development and authorization of New Venture Charter School, a transfer high school which shares Lavelle Prep’s commitment to leveling the playing field for students living with emotional challenges. New Ventures promotes college and career readiness for overage and under-credited, as risk youth, aged 16-21 living on Staten Island, enabling them to graduate from high school prepared to excel in their academic, professional and personal lives. ICS’s most recent development, The Lois and Richard Nicotra Early College Charter School (Nicotra Charter) is designed to provide an innovative pathway to college graduation for all students including those living with emotional challenges as well as those with other disabilities in all classes and activities. This exciting program will provide an accelerated pathway to higher education which will enable students to graduate from high school with a Regents diploma and as many as 60 college credits from St. Johns.